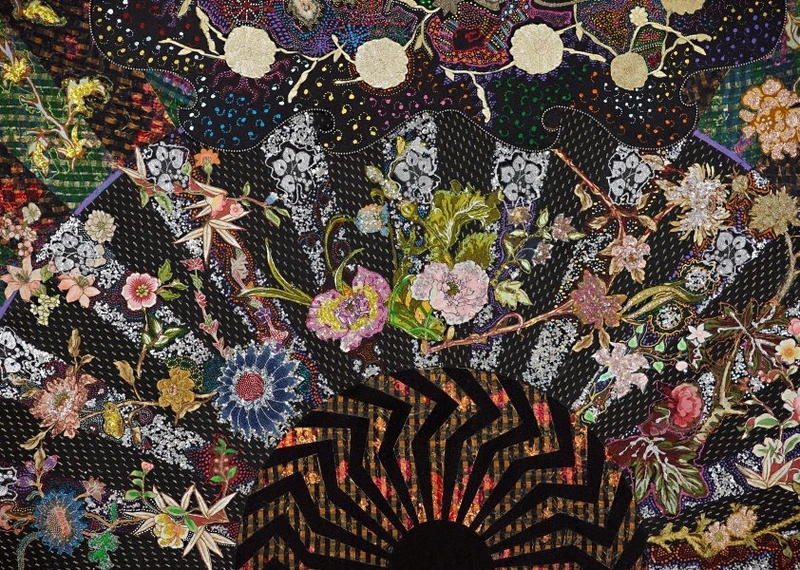 With its use of collaged fabric and decorative patterning, ‘Black bolero’ exemplifies the two art movements that Miriam Schapiro helped to shape: feminist art and the pattern and decoration movement. 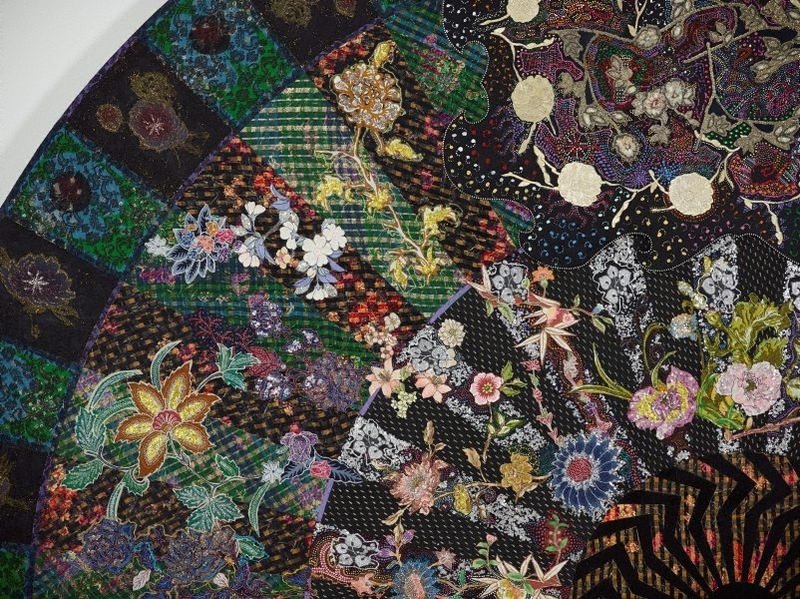 Her use of appliqué and decorative motifs was seen as a feminisation, and a critique, of the reductive abstraction that dominated the art market at the time – a gesture that parodied the concise abstractions of male artists such as Frank Stella with an excess of decoration. After early success in New York as a hard edge colour field painter, Schapiro began tutoring at the University of California in San Diego in 1967. Here she met the radical feminist artist Judy Chicago and later, with Chicago, started up the first Feminist Arts Program at Cal-Arts, Los Angeles. With 21 students, they created Womanhouse, a community-based project that involved taking over a house and allowing each student to create an installation/environment in one of the rooms. The teaching involved daily consciousness-raising sessions in which the women discussed not only art issues but were encouraged to talk about their personal experiences of being a woman in a male-dominated society. Following her involvement in Womanhouse, Schapiro began lecturing across the United States using slides of ‘traditional’ women’s craftwork such as knitting, embroidery, lacemaking and quilting, explaining how a history written by men had marginalised and trivialised these crafts and in doing so had excluded women’s important contribution to American culture. In her own work, she began using fabric collaged onto the paint of her canvases and shaping her canvases to resemble giant fans and hearts. 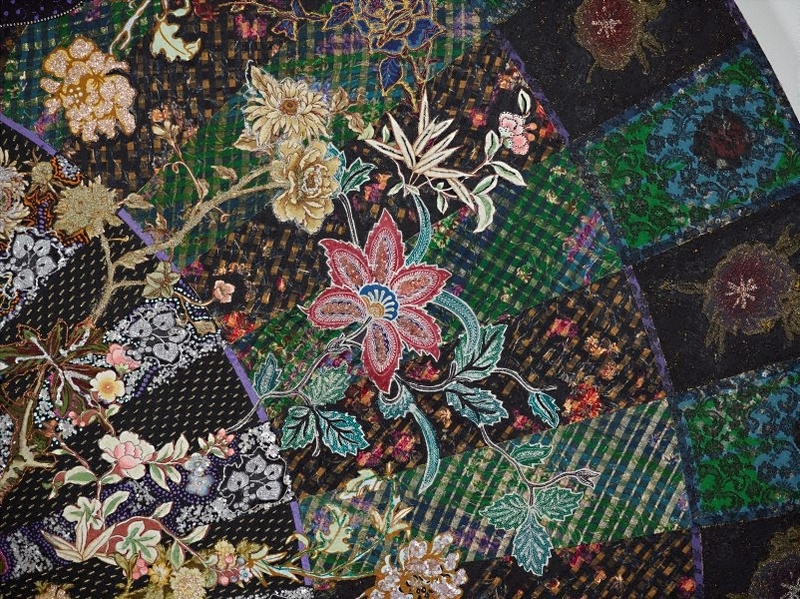 She coined the term ‘femmage’ to describe her collages using elements of traditional women’s craftwork. In 1974 Schapiro returned to New York. With fellow artist Joyce Kozloff, she organised meetings and discussion groups with the aim of starting up a women’s art school and feminist art journal. This resulted in the foundation of both the Feminist Art Institute and the journal ‘Heresies’, which became a major voice of the feminist art movement and helped to change entrenched attitudes towards women artists in many parts of the Western world. Also in New York, she started exhibiting with other artists who were using patterning in their work, both male and female, such as Joyce Kozloff and Robert Zakanitch. They became known as the pattern and decoration movement. Signed and dated verso, black crayon "MIRIAM SCHAPIRO 1980". Anthony Bond, Art Gallery of New South Wales handbook , 'Contemporary', pg. 94-108, Sydney, 1988, 105, 108 (illus.). public galleries', Art and Australia (Vol. 21, No. 3) , 'Commentary: Recent acquisitions, Sydney, Autumn 1984, 326 (colour illus.). Bruce James, Art Gallery of New South Wales handbook , 'Western Collection: Paintings and Sculpture', pg. 17-77, Sydney, 1999, 73 (colour illus.). Graeme Sturgeon, Art and Australia (Vol. 20, No. 2) , Exhibition Commentary: 'The 4th Biennale', pg. 188-191, Sydney, Summer 1982, 190 (illus.). Portrait of a Gallery , Sydney, 1984, 63 (colour illus.). Art investigator , ''Ideas and Themes' - A Feminist Perspective', pg. 242-43, Melbourne, 1998, 242 (colour illus. ).